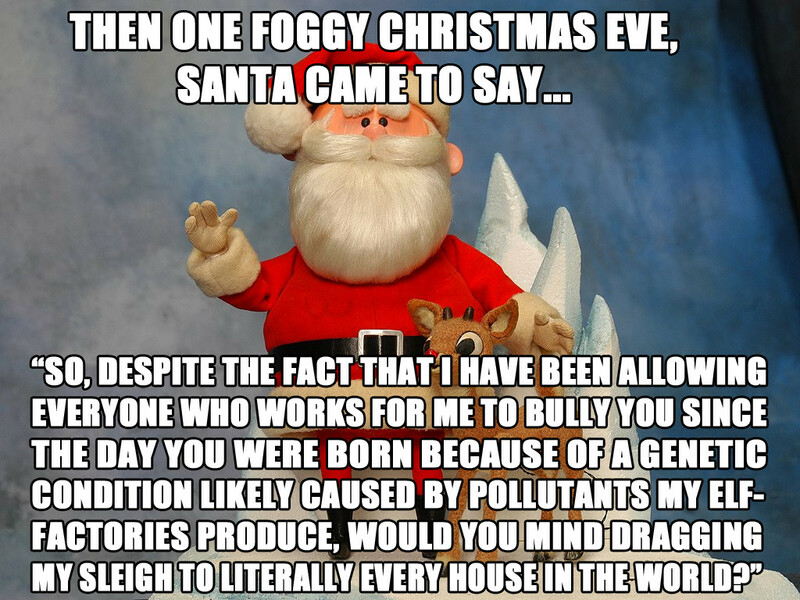 Santa is a big, fat jerk and a bigoted, d*ck, apparently. Rudolph’s father was “abusive”. Comet was a terrible coach. Yukon Cornelius is a gun-toting redneck who engages in animal cruelty. GASP! And who isn’t triggered by Burl Ives’ character, Sam the Snowman?! He’s ALL WHITE for crying out loud! If you sing along to any Burl Ives’ Christmas Carols, you might be a white supremacist. Delete all Burl Ives Christmas tunes from your Apple playlist STAT! Never mind, I forgot. These folks would never know how to have a Holly, Jolly Christmas if someone threw it at them and gave it to them gratis and called it a college education. As a kid in the 70s and 80s, I would look for its listing in the TV Guide. Rudolph the Red Nosed Reindeer was one of my most beloved, go-to Christmas classics and still is. But now, in the days of woke, the story behind Rudolph the Red Nosed Reindeer is “seriously problematic” and those who don’t see it this way have “serious problems”. Those people are, according to the hyper-vigilant SJWs, Conservatives. Whilst making tongue-in-cheek social justice commentary about Rudolph, they have neglected the key takeaways of this story from years ago. Although he was bullied, left out of all of the reindeer games, unaccepted, different-quirky even-young Rudolph was able to overcome and do something absolutely great. He saved the day! He made kids smile. And his story is magical. He didn’t stomp his hooves and whine and go to a “safe space” and resign himself to life being too hard as a red-nosed reindeer and call it quits. He didn’t blame others and become a victim. He didn’t expect special treatment or demand it from his peers because he was different. He may have shed some tears and that’s okay. When given a challenge, he rose to the occasion and excelled and proved his biggest critics and his bullies wrong. If your goal is to tear down current American society and remake the culture—and that is what current progressive activists want to do, and are making alarming headway—deriding and poisoning cultural icons and popular stories and songs is essential. This is Maoism, U.S. style. It takes no great talent to deliberately look for a negative interpretation of any work of art, story or tradition, and as this dumb controversy (and the similar one regarding “A Charlie Brown Thanksgiving”) proves, nothing is safe. It is all part of cultural bullying and indoctrination. As Victory Girls correctly notes, the story of Rudolph resonates with kids because the moral is legitimately inspiring, and intrinsically American. Underdogs (or underdeer? ), can and do prevail. Special talents and and features of an individual that no one appreciates for years or decades can suddenly win accolades, solve problems, or change lives. The story doesn’t encourage bullying; it shows how individuals rise above bullying. The story of Rudolph is similar to the true story of Ethics Alarms Hall of Heroes inductee Desmond Doss, except that he didn’t have antlers. We can’t tell from the song lyrics whether Santa stopped the reindeer from being mean to Rudolph; I always assumed he did, being Santa. The lyrics only say they they used to call Rudolph names. This is good zoology, by the way: animals typically isolate and shun members of their species who seem too different: it’s part of natural selection. The song also doesn’t say that Rudolph wasn’t a regular part of the team. Again, I always assumed he was. “Dasher and Dancer and Prancer and Vixen, Comet and Cupid and Donner and Blitzen” were the team when “The Night Before Christmas” (“A Visit From St. Nicholas”) was written in 1823. The average lifespan for a reindeer is just 4.5 years. Even assuming that the flying variety is more hardy, that team was long gone when the song was written in 1939, when the team consisted of Biff, Myrtle, Flippy, Bambi, Clomper, Jellynose, Gherkin, Millard, and Agamemnon. Rudolph was in the back, until that fateful foggy Christmas night, when Santa had his brainstorm. Funny how her criticisms deal almost exclusively in stereotypes, but, if we like the story, WE are the bigots. The negative behaviors are not ENDORSED by the movie. Without the negative behaviors, there is no reconciliation at the end. I worked for Rankin/Bass in the 80’s, long after their historic Rudolf show was created, but there was a little plexiglas display that contained the little Rudolf articulated model used in the production. It was kind of a moment to see him there. Last year we watched, my wife and I, that original program and found it to be very satisfying. Laugh out loud funny, inventive, peculiar and wistful. I’m pretty confident I didn’t consciously draw any message, positive or negative about bullying or anything else from it, but it did, and does, entertain. Anyone who is harmed by this charming work of art is beyond hypersensitive. They really should be living in a bubble. They probably already are, of one kind or another. If you are THE Jim Ross Meskimen, hope you comment more, your perspective on topics would be interesting. The host seconds that hope. Good thing Autry went into singing rather than becoming aggrieved and working in the labor movement the rest of his life. He’d have turned into Marvin Miller instead of an MLB owner. Funny how he parlayed that nasal Willie Nelson-like tenor voice into a career. The only entertainer with FOUR stars on the Walk of Fame: one for TV, movies, radio and song-writing. He was also the least impressive physically of all the movie cowboys, but pulled it off. I just watched a marathon of the Rankin-Bass specials this weekend. To be fair, the special takes liberties by expanding the story in the song. In the RB version, Santa is wowwed by Rudolph’s giant leap until he sees the red nose and chastizes Donner for it. So, yeah, he starts off a big jerk, but the special specifically points out at the end that he realized he’d been too harsh. And, since Donner is Rudolph’s dad, we assume the original team is still there. Maybe magical reindeer are long-lived? The original moral is still there. Oddities don’t make someone less valuable. What makes us different can be helpful. Don’t judge a book by its cover. I’ve never cared for Rudolph’s girlfriend, Clarice, though. Seemingly the Santa tradition of being borne by reindeer seems to have some origins from Norse influence in which Odin was borne by his 8 legged horse, Sleipnir. If Odin is to be seen as eternal, then certainly his horse must have been too…so vicariously can we assume the Reindeer are as well? My dislike for Rudolph comes more from the song itself. “Hey, it’s okay to be different, as long as your difference is useful to us.” (One of the reasons I left the DNC.) I will admit that as a kid I always found the Rankin-Bass shows slightly creepy. It has nothing to do with Burl Ives being a white snowman (gasp!). They always gave me a sleazy carnival vibe. Ironically, couldn’t it be argued that the song sings the praises of diversity? Dial back your snowflake settings guys. My first reaction was the same as yours, but then I read the Huffington Post article quoting the original twitter thread. It’s clear that people were joking. The link doesn’t work for me Greg. I recall a joke years ago by a psychiatrist with Rudolph undergoing therapy because of his ‘abuse’ at the hands of all around him. Everyone laughed at it! They are not alone anymore. The Maoist pc crowd would probably be fine with this. Today a meme taught me two new words. That’s how you can tell we live in the future. I gotta admit when I first read it, I thought it was un-funny sarcasm. If the author meant it, she’s one sick puppy. I always like Cornelius. The Dentist Elf always freaked me out but oddly fascinated me (that might explain why I ended up marrying a dentist). PS: Why would you name a female reindeer “Vixen”? According to Merriam-Webster Dictionary, a vixen is a female fox and a sexually attractive woman. What doe* those have to do with reindeer? Foxes are more socially acceptable than reindeer in the furry community. And now I’ll go sit in the corner by myself.